Datum objave: 27. 05. 2004. I visited Croatia quite recently and I was amazed to see the large amount of locals that consume pasta as part of their daily diet, so it came to my mind the idea of starting a series of articles focused on the history of Mediterranean food.. It is a very common habit of people to go in search of who invented something and where and when and how. But in the particular case of food it is very difficult, when not impossible, to give the right answer to these questions. Since I always found the history of pasta fascinating not just for the facts, but also for the many myths and untruths that surround it, it was the perfect candidate to start this series of articles. The history of pasta goes way back beyond Marco Polo and starts around 10,000 years ago when man started to live in a fixed place without moving continuously. Archaeological findings of wheat farming suggests that people from the Jordan Valley were among the first to make and consume some basic form of pasta. Centuries before the birth of Christ, Greeks and Etruscans made the first “lasagna” and other types of pasta. 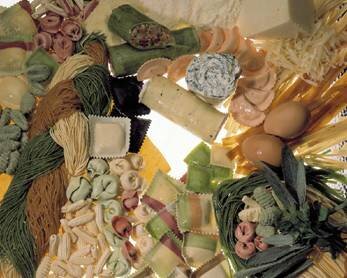 The word “pasta” derives from the Greek word “pasth” that means “a pastry of water and flour”. And also from Greek comes the word “laganon”, that was used to indicate a large and thin paper of pasta cut in stripes. From the 3 rd century BC onwards, the Roman Empire spread as far as the border of the world known in those times. In the meantime, the city of Rome increased its population from only 100,000 inhabitants in 264 BC to 1,500,000 in 155 AD. The main problem of course was to supply enough food since the agricultural production of the countryside surrounding Rome was not sufficient for such a huge population. And cereals were in part the solution for this problem. Wheat was distributed monthly, free of charge to lower classes whose first problem was to stop the action of insects and parasites, using two different techniques: toasting or milling the grains. The toasted grain could be stored for some time and were milled before cooking them in boiling water, to prepare a type of polenta. On the contrary, the transformation of wheat in grain flour was only a temporary solution. It could be infected not only by new parasites, but also by humidity and mould. To avoid this risk, people used to bake bread and focacce twice over, transforming them into a sort of biscuit, a product easy to store for some time. Or to work flour into dough, to roll out it in thin foils and let it dry in the sun. The result was "dried pasta", the first dried pasta in the history, preservable for long time (at least one year and more) and usually cooked mixing it in vegetable soups, the famous Roman pultes. Therefore, the origins of pasta are not so glamorous and noble as we would like: pasta is a humble product, invented in poor families to prevent a basic food from deterioration and to settle a provision in fear of failing the next public distribution of cereals, due to famine in the producing areas, storms over the ships that carried them to Rome, or a more dangerous infestation in the Roman granaries. And of course, thanks to its poor origin, pasta had no place in the pages of writers, nor in the memory of historians and poets of the imperial age. There is no mention of pasta because when food becomes the subject of history, it is usually the food displayed on the tables of the rich and the powerful and not the food on the tables of peasants. It is also truth that in a parallel manner, pasta consumption was developed since ancient times by the Arabs and Chinese, as a matter of fact, there is record of some sort of noodles called itriyah cooked by boiling in the Talmud. But it is undoubtedly thanks to the Romans and Italians that it became known all over the world. Pasta became part of the daily diet in Southern Italy for the following reasons. Firstly, a national lack of money around the 17th century caused a drastic reduction in the ability of families to buy things. Secondly, the kneading machine and press were introduced. This new mechanism allowed wider distribution and greater factory production of pasta than was possible with handmade fresh pasta. And last but not least, the economic crisis lead to the relative concentration of large farms. This created conditions favourable to the expansion of durum wheat. The basis for pasta's sale as a very cheap and readily available food for the poorest classes was thus established. It was Catherine Medici who introduced it to France in the 18th century. That set the ball rolling and helped turn it into the popular dish it is today. It became known all over Europe and finally reached the most important city in the world back then: London. By the 1770's the word macaroni had a special meaning in England: the word “macaroni” meant perfection and elegance. It was common practice for the English to use the slang phrase “that's macaroni” to describe anything exceptionally good. So pasta stopped being food of the poor and became something really posh and trendy. The most refined cuisine triumphed on the tables of the rich and the nobility, plentiful with fresh stuffed pasta that, little by little, became a gastronomical habit of the wealthy classes, who not always prepared it at home, but more and more bought it in the fresh pasta shops that, mainly in Northern Italian cities, were opened by specialized craftsmen. To make things even better, something really interesting happened at the start of the 1800´s: pasta met tomato. And tomato sauce altered the history of pasta forever. The first mention of using tomato goes back to the 17th century. It was imported into Spain by the conquistadores of the New World, and later spread throughout Europe, finding an ideal climate for cultivation in the Mediterranean countries. The Sienese botanist Pietro Andrea Mattioli was the first in Italy to call the tomato by the name it has retained ever since in Italian: pomo d'oro or golden apple. While Italians refer to it as a pomodoro, the French, English, Spanish and Germans continue to use terms directly derived from the name the Aztec Indians of Mexico gave it in Nahuatl language: tomatl. Anyway, things continued to improve and in 1827, a woman called Giulia Buitoni set up the very first pasta manufacturing company: “Il Pastificio Buitoni”. That company still exists today; nearly 200 years later, and is one of the biggest and more popular manufacturers worldwide, and is now part of the Nestle group. The discovery of electricity in the early 1900's made life much easier for the pasta industry. Machines were invented for mixing the dough and electrically controlled drying chambers were introduced. Pasta was no longer limited to warm climates and on pressing a button the quantity of pasta that had once taken a month to produce was obtained in an hour. Today pasta-making has become very automated. The whole process of reception of raw materials, production, packaging, and dispatch can be performed completely automatically by computers. But the basic ingredients for pasta are still flour and water. Some good old things never change. Quality pasta is made from 100% durum wheat, milled into a produce semolina, especially bred for this purpose worldwide. The protein of durum wheat is mainly responsible for the cooking quality of pasta products: a high protein content and a strong gluten are required to process semolina into a suitable final pasta product. After this quick stroll through the centuries, we can confidently say that dried pasta is a culinary invention uniquely and typically Italian and whose preparation and consumption spread throughout Italy because of a combination of numerous events and historical-social conditions. At the same time, pasta appears to have been waiting patiently for the right time for centuries… the right time to emerge from the darkness as a simple primary food just capable of satisfying hunger to become a delicacy capable of pleasing the most demanding palate. Today there are about 600 different types of pasta and almost every supermarket in every corner of the world offers a really wide range of products. New shapes are frequently introduced or revived. It is one of the most popular products in the world for sure. However it is still the Italians who love pasta the most. They say that pasta is like poetry. They love it so much that there is even a museum just for pasta, the Museo Storico Degli Spaghetti in Pontedassio, Italy.